The Guardian’s obituary for Fr Ken is here and the one in the Daily Telegraph is here. The Times obituary is reproduced in the comments, below, and the Independent’s is here. The funeral liturgy and eulogy can be found here. 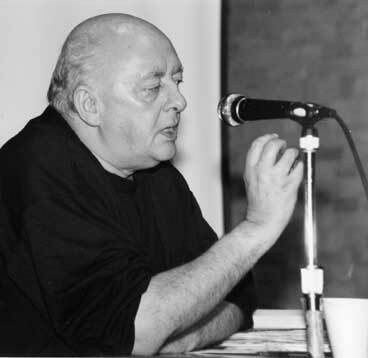 Fr Ken became the leading representative of Christian Socialism in England. He served the majority of his ministry in the East End as priest, community theologian, author and pastor. Throughout his ministry he tackled homelessness and drug dependency. He was founder and director of the Soho Drugs Group, a founder and director of Centrepoint, and director of the Runnymede Trust 1987-1990. 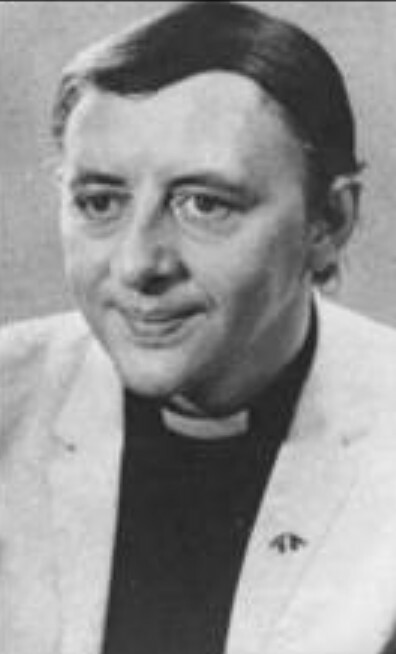 A convinced socialist and radical Anglo Catholic Fr Ken loved the fun and ‘twinkle’ of Anglo Catholicism while at the same time challenging what he described as the ‘gin, lace and backbiting’ sub culture. He was a firm supporter of LGBT rights and a Catholic ministry ordaining women as priests and bishops. Ken coined the phrase ‘subversive orthodoxy‘ to describe his ministry and outlook. Archbishop Rowan Williams, commenting on the lack of radical prophecy in the Church of England has said We need a voice like this … speaking with unsubdued feeling about the gospel. The plain truth is that no one else writes with such authority about the pastoral (and prophetic) task in our church. Fr Ken retired to his home area and in 2011 suffered complications during surgery, from which he never fully recovered. He has been tenderly cared for in his later years by Julie, his wife. Recently Ken and Julie have been worshipping at St Chrysostom’s and Fr Chris anointed Julie and Ken and gave them Communion a few hours before he died. Fr Ken has been a great inspiration to Fr Ian in his ministry and Fr Ian was pleased to be able to be with him and Julie for a while before Ken died. Several years ago Ken gave a lecture at St Chrysostom’s on an influential priest in his life, Fr Gresham Kirkby, and more recently told us of a special holy place in his life. We thank God for Fr Ken’s prophetic and challenging ministry in the Church, we pray for the repose of his soul, and pray especially for Julie, Carl his son, and all who mourn him. From a leaflet, Action for Revival, Fr Ken wrote in 1974: If spirituality and prophecy are not held together, both must decay. There must be contemplation and resistance, holiness and justice, prayer and politics. For our vision is of a God whose holiness fills heaven and earth, and who has called all people into freedom, justice and peace within his new order. This entry was posted in Anglican, Anglo Catholic, Catholic, Christian and tagged Ken Leech. Bookmark the permalink. Thanks for this post. I met Fr Ken when I started work with UNLEASH (Church Action on Homelessness in London) in 2003. He was a great encouragement and source of inspiration to me. Although I haven’t seen him in a while I have been getting occasional updates about his health from Fr Paul Butler and Fr Alan Duncan, who serves here in Bethnal Green where I live. Also Carol Graves who knew Ken in the 60’s and kept in touch. I hope to attend his funeral, when the details are made known. Many thanks for this. Fr Ken’s writings have been very significant in my life, as has his lived example. May he indeed rest in peace and rise in glory. Kenneth Leech taught me what being a Christian is all about and what it is to be a priest. He long has been my model. I have found his writings a constant encouragement and challenge. I discovered his book, The Social God, while at theological college and learnt how my vocation made sense. I, too, have sat at his ‘feet’ a total inspiration about what a Catholic Priest should be like, and I hope that my priesthood has been guided by the need to live and work within the community, sharing God’s love for the outcast and marginalised. Kenneth Leech influenced me more than any other priest or theologian. It was a privilege to be part of the Jubilee Group with him, even if only an occasional member. Fr Ken was a massive inspiration to me. I seek to live out his ethos through my work. I treasure the memory of the support he gave me when researching Dorothy Day for my undergraduate dissertation back in 1998/9. His influence next door at Holy Is’ has also been profound. It was a real joy to write to him and get his support on the Faith Leaders’ call for a Jubilee for Justice a couple of years ago. Rather a suitable cause. I knew Ken Leech in his capacity as an active anti-racist, anti-fascist and fighter for social justice, especially in London’s East End. He was the Director of the Runnymede Trust form 1987-1990 when I worked there, and we had a shared fascination with all matters to do with the East End. He was a lovely person with a gentle sense of humour and had a fantastic memory for detail. I will miss him. He had many friends and contacts in the East End and I have informed our mutual ones of this sad news. Please let me know of the funeral date and any memorial event so I can pass the details on. Ken was a prophetic beacon of light to many. I have some lovely photos of Ken and I standing under a painting of Thomas More. Ken, like More, had a passion for the relationship of spirituality, life in the church and a burnished gold prophetic vision of faith in the public square. Ken certainly carried such a torch wisely and well. I cherish our many conversations together. I had the privilege of knowing Fr Ken whilst I was the vicar of Micklehurst in Mossley, where he settled and he worshipped with us from time to time. He was a loving gentle man and an inspirational priest. I am a retired Priest now and we had been praying for him at the church I attend now, (Friezland) and it was a sad moment when I learnt of his passing. May he rest in peace and rise in glory! As an idealistic young curate working in Soho in central London at the height of the drug culture in the Swinging Sixties, Kenneth Leech founded a shelter for homeless young addicts. The result was the charity Centrepoint, which has since helped more than 100,000 young people over more than four decades and for which Diana, Princess of Wales was the first patron. With £30 in the bank and 20 surplus beds borrowed from a hospital, Leech and his team of volunteers, who included probation officers and novices, opened the doors of the basement of St Anne’s on Dean Street in December 1969. The room had, until then, been empty apart from cockroaches. Leech took the charity’s name from its geographic location and also because it operated in the shadow of the office tower, Centre Point, which stood empty. The charity provided hot meals, a bed and counselling. Every Christmas for many years afterwards, he received a telephone call, to thank him, from a former junkie who once overdosed at Centrepoint. Soon known to the public as “Father Leech of Soho” or “the drug addict’s friend”, he recalled scrounging food from pubs. One gave him “bucketfuls of very good beetroot soup, not necessarily what the young people really wanted”. He also took a call from the Labour politician Lord Longford, who said he had a friend in the soup business and perhaps he could help. Shortly afterwards, Leech received 100 cans of John Lusty Lobster Bisque. It was in 1967 — as the Beatles’ Sgt Pepper played on the radio — that Leech had made his home in a small flat in Kingly Street, Soho. He could hear the sounds of Carnaby Street. His parish of St Anne’s contained Piccadilly Circus and Leicester Square. He described his parishioners as “those who pour into the district by day or by night” — a combination of artistic middle-class dreamers addicted to heroin; “teeny bopper pillhead kids”; a group of lesbian methedrine users; and working-class youngsters from the fringes of London. His “loitering ministry” embraced the coffee bars, clubs, pubs and street corners that they frequented. He soon had on average three people sleeping on the floor of the flat he shared with his first wife, Brenda Jordan, a student of psychology at University College London. The marriage was later annulled. He blamed the rise in drug-related crime and disorder on the “virtually non-existent facilities for treating addicts” and the passing of the Dangerous Drugs Act in 1967 that made it an offence for GPs to prescribe heroin and cocaine for addicts. He also met a young Paul Simon, who wrote the song Blessed in St Anne’s. Leech said that the singer represented “the alienation of many young people from organised religion, and their search for authentic spirituality”. By 1971, Leech was suffering an “inner tiredness” and sought a new direction. He was determined that the Church of England must formulate its own response to drug addiction. He took a post as tutor of St Augustine’s theological college in Canterbury, teaching social theology and preparing ordinands for city life. Kenneth Leech was born into a secular, working class family in Ashton-under-Lyne near Manchester in 1939. He recalled that, much like a Lowry painting, the view from his bedroom was of factory chimneys. His mother worked in the cotton mills. He became a Christianafter listening to Father Trevor Huddleston, an anti-apartheid activist, in 1956. Leech graduated in history and theology at King’s College London and Trinity College, Oxford. While studying in London in 1958, he lived on Cable Street in the East End where he taught English to the Somali community. A great influence was Father Joe Williamson, who worked in the brothels near the docks. “He was an exhibitionist who acted first and thought afterwards. He showed me it was possible to be a priest without being respectable or a conformist,” he said. Leech trained for the priesthood at St Stephen’s House in Oxford, and was ordained in 1964. He was then curate of Holy Trinity, Hoxton, in east London during the era of the mods and rockers and met his first heroin addicts. He returned to the East End in 1974 as rector of St Matthew’s, Bethnal Green.From 1990 until 2004, he lived in a book-lined attic flat in Whitechapel and became an adviser to St Botolph’s Aldgate. He wrote 14 books including Soul Friend (1977), which examined the influences of drugs and Eastern culture on Christian spirituality. With his first wife, he co-wrote the first school textbook on drugs:Drugs for Young People: Their Use and Misuse. He said: “I felt that there was a need for a fairly cold, factual account of drug abuse problems, which was addressed directly to adolescents.” When visiting schools he did not shy away from using slang, such as “pillheads” and “junkies”, and told one group that, just a few days earlier, he had buried an addict aged 23. He married his second wife, Rheta Wall, a nurse, in 1970. They divorced in 1993. He is survived by their son, Carl, who studied politics. He is also survived by his third wife, Julie Bond, a former teacher of social anthropology whom he married in 2014. He had been ill since 2011 when he suffered a heart attack. Leech denied being a “hippy cleric”. He said that he was an orthodox Anglo-Catholic, albeit one who was well to the left of the Labour party. He listed cartoons and pubs as his hobbies and enjoyed reciting comic verse.